It is my contention that good manners and being nice are a prerequisite for companion dogs. We expect politeness and respect from our children and each other, why not from our dogs? A dog that is extremely affectionate and “just loves everybody” can be great but not if she’s jumping on a young child. Even small dogs can scratch your legs or the face of a toddler. I use the same correlation with my children and grandchildren – you can make straight A’s and score every touchdown, but if you’re not nice, who cares? Kinda like “pretty is as pretty does,” a saying my wife grew up with. Imagine how we feel as groomers when a dog has to be dragged in, jerking its owner all over the place and unresponsive to commands. What do they imagine is going to take place when we require that same dog to be still three feet off the floor on a grooming table with scissors and noisy clippers around him? It’s impossible for us to train a dog that we only see once every 6 to 8 weeks. Remember, initial basic training needs to happen a couple of times a day, every day, for at least a half an hour. Not only is a well-trained pet easier for us to handle, but that dog will be more comfortable during grooming. Let’s take a look at that process and figure out what kind of training (education) and exposure would help your dog accept it. Yes, I say “accept.” Expecting your dog to “like” grooming is like expecting us to like the dentist! Honestly, we are content with a certain level of tolerance and if we get an occasional lick on the face or a tail wag, that’s a bonus. It only makes sense when you consider what your dog likes to do and what actually happens here. Your dog loves to run freely, smell everything, play ball, go for a walk and eat. Here, she needs to stand still on a table while we brush out tangles, poke in her ears with cotton swabs, take vibrating clippers over her body to cut hair, then into the tub for a bath and scrubbing with a brush, followed by blow drying from a noisy machine. And let’s not forget her favorite activity, getting her nails clipped. For your dog’s sake and ours as well, there is some basic training you can do. House Breaking: As in your home, it applies here as well as at the veterinary clinic or friend’s house. We all appreciate a dog who knows that the bathroom is outside, not inside! In addition to training, ensure that you take your dog on a good walk before coming in–poop and pee please. With your permission, we will walk puppies and geriatrics as age may dictate more frequent needs. Now that I’m sixty-three, when I need to go, I NEED TO GO. So I’m happy to walk the older dog. Lead Training: We groom with scissors and clipper blades, both of which are sharp enough to cut hair so they can be dangerous. In order to stabilize a dog and keep them centered on the table, we use a grooming noose. This simulates a lead and collar (which, when used properly, keeps your dog under control and by your side). If a pet responds properly to being on lead, holding still on the table with the gentle assistance of a noose makes sense as well. Even dogs who run free on a farm or in a fenced-in back yard benefit from lead training. Blow Drying: Introducing your dog to a hand held hair dryer at home helps in two ways – he can get comfortable with both the noise and the feeling of forced air. First, simply introduce the dryer by turning it on and keeping it at a distance. Don’t get emotional, stay calm. Any anxiety on your part will be reflected in your pet. When your dog is comfortable with the sound, bring the dryer closer and eventually make contact on the back, above the tail where they love to be scratched. Don’t go near his face. After many brief sessions of turning the dryer on and rubbing the back, you can gradually move around to the rest of the body. In addition to the noise, he will learn to accept the vibration, something the clippers will do. We have some dogs that come in for a first haircut and are so laid back that they accept each phase with ease and grace (I want some of what they’ve been smoking!). Others may well go ballistic. Training is a very personal thing and depending on your dogs predisposed personality, you may have to spend more time in each phase. Maybe it won’t work at all. Even dogs from the same litter can react to the world in completely different ways. Paw Holding: Most dogs don’t like their paws messed with and nail clipping is high on the list to get a “don’t you dare!” reaction, most often expressed by a raised lip and growl. Same goes for tails. Teaching your dog how to “shake” is a good way to start. Each time you take his paw in your hand, try to hold it for an increasingly long period. Once he will let you hold on for a while, begin to massage the toes separately. Increase the duration and we will probably be able to clip nails and scissor around paws with ease. Brushing and clipping the leg will also come easier. You can use a similar method with the tail. Take it gently and hold it for longer each time so that your dog can accept the position. Socializing: Get your dog out and about at an early age. Introduce her to other dogs as well as people. Remember, when you first introduce your dog to us, we will be total strangers. Some dogs are instinctively more wary than others simply because of breeding. My golden Lizzie never met a human she didn’t like…and that was from day one. Most guard dogs are not that way. Keep in mind, we are a grooming Salon and have as many as 25 – 30 pets here during our busiest times. While we don’t allow dogs from different owners to share a run, they are next door and your pet needs to accept that. All that being said, happy training and thanks! Every bit you do at home makes an impact with us. If you would like some help with your training, we would like to recommennd Alison Wilson, a local operator of Bark Busters Home Dog Training. 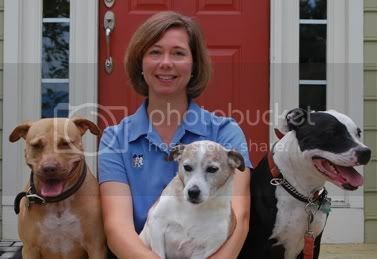 My name is Alison Wilson and I am the owner/operator of Bark Busters Home Dog Training. I am a certified behavioral trainer of dogs and their owners. The Bark Busters method focuses on a dog’s need for consistent leadership and education to become a good citizen in our community. Dogs don’t instinctually know how to behave; we need to teach them how to be socially acceptable in our world. I became a Bark Buster trainer after my work experience at the SPCA. I saw many dogs being passed over for adoption because of their exuberance or what some may have misinterpreted as behavior that can’t be changed, but was merely fear in the kennel. I saw dogs being surrendered by their owners to the SPCA for reasons that I knew could be corrected with training, guidance and consistency. These were great dogs; they just needed a good education. Like me, Bark Buster company founder Sylvia Wilson worked at an RSPCA, but in Australia. She developed the Bark Buster method by observing how dogs communicated with one another, how they let each other know when they were pleased and not so pleased. She and her husband launched the company in Australia in 1989. Bark Busters Home Dog Training has since helped well over 550,000 dogs and their owners world wide. This entry was posted on Saturday, October 3rd, 2009 at 11:36 am	and is filed under Training. You can follow any responses to this entry through the RSS 2.0 feed. You can leave a response, or trackback from your own site.